Acrux Realcon is a leading real estate company in the temple city Bhubaneswar, Odisha. This company is committed to provide quality customer services and affordable housing projects every year in the best locations of the State. This company is not a Real estate and Construction Company but a brand with International quality, Innovation, Design, Planning, Creativity, and Timely Managements. This company provides values to their esteemed customers with best Cutomer’s support. 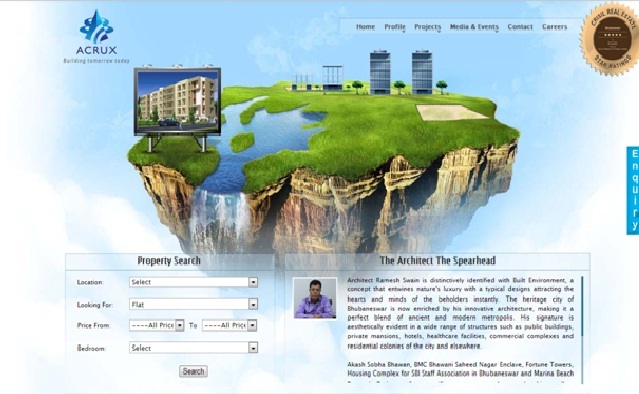 The Managing Director of this company is Architect Ramesh Swain and Director is Architect Rahul Swain. This project is situated at Patia, Bhubaneswar, Odisha. This project is a distance of 500 meters from Big Bazar, 2 km from Patia Railway Station, 500 meters from Xavier’s International School, 2 km from Infosys and TCS, and 7 km from Jaydev Vihar. The features of this project are approved by BDA and Banks, A/C Community Hall, 24 hrs Water supply, and Security, Cable TV facilities and Children’s park. This project is located at Ghatakia, Bhubaneswar, Odisha. This project is a distance of 3 km from Bus stand, 5 km from Airport, 7 km from Jaydev Vihar, 10 km from Railway Station, and nearer to reputed institutions. This project is located at Gothapatana, Bhuabaneswar, Odisha. This project has 792 numbers of units. The features of this project are Children’s play ground, Badminton court, Jogging track, 24 hrs generator, lift, and security facilities, CCTV system, Club with multi gym, A/C community hall, Swimming pool, Restaurant, Temple and Shopping complex.